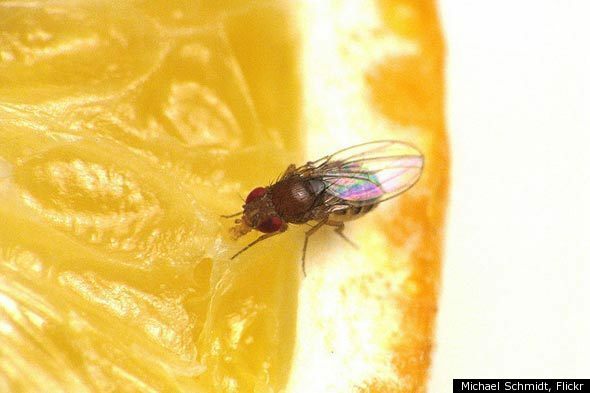 If you've ever accidentally let a bowl of fresh-picked fruit get a little too ripe, then you have one question on your mind: How do you get rid of fruit flies? ("Where are they coming from?" is a close second.) I tested 8 of the most common homemade methods for getting rid of the teeny pests. Here's what worked, and what didn't. Here's an equation that you never wanted to learn: Hot Temperatures + A Forgotten Apricot = Fruit Fly Bonanza. The apricot in question had worked its way underneath a loose flap at the bottom of the paper bag. Thinking it was empty, I stowed the paper bag (I like to keep them handy whenever I need paper for transferring clothing patterns) and went away for the weekend. When I came back, my two cats were both in the kitchen, kind of looking twitchy. I had assumed that they finally went crazy from a weekend without treats, until I saw the cloud of fruit flies around their food dish. Yep, we had fruit flies. After cleaning the kitchen, dumping out the cat food and killing many generations of fruit flies with a few disgusting smacks, I decided to get even. Like the other two pest tests, I didn't want to use harsh bug sprays because of the cats. And since I'm gone for about 12 hours a day, the solution had to be one that would work without close supervision. The internet agrees that the best way to get rid of fruit flies is to start with a trap. Basically, you put some bait inside a tall glass, top it with a funnel and wait for the flies to meet their demise. Why a funnel? Because it creates a small entrance for the fruit flies, while still trapping them inside the glass. (Most fruit flies aren't smart enough to figure out that the entrance can also function as an exit.) Also, it will prevent curious pets from drinking the bait. For my tests, I used a pint glass and an old plastic funnel. - Toothpaste. A friend of mine spent a week on vacation at a lakeside cabin. Unfortunately, the cabin had a fruit fly problem, particularly in the bathroom. She moved cabins within a day, but not before she noticed the flies gathering around the freshly-used toothbrushes. The assumption was that toothpaste attracted the fruit flies. So, I put about a tablespoon in the bottom of the glass. A day later, there were still zero fruit flies in the trap. Bottom line: Does not work. - Apple Cider Vinegar. This type of vinegar always comes up whenever a discussion of fruit flies occurs. When I worked in a bakery, we used it in our traps (fruit flies are attracted to the fermentation produced when bread rises) but I didn't remember it being successful. So, a friend with a biology background mentioned heating the apple cider vinegar in the microwave for about 10 seconds. This will release more of the vinegar's fragrance, which fruit flies can't resist. I poured a 1/2 cup of the heated apple cider vinegar into the trap. A day later, there were dozens of fruit flies in the vinegar. Bottom line: It works, especially if you heat it beforehand. - Wine. This was discovered accidentally. I had abandoned my wine glass at a party, when I came back, there were two fruit flies floating in it. Gross. But when used as a bait, it's exceptionally effective. Pour a 1/2 cup of wine (fresh or old) into the glass, then watch the flies flock to the stuff. Bottom line: It works wonderfully. - Banana Liqueur.I was given a bottle of this terrible concoction as a gift. I used it exactly once. I figured that if wine worked, maybe a liqueur would, too. And it's sickly-sweet with a banana scent. Sounds like something a fruit fly would like, right? Wrong. Turns out fruit flies are just as grossed out as we are by banana liqueur. They avoided the trap entirely. Bottom line: Does not work. Throw the bottle out. - Tequila. Another accidental discovery. A guest knocked over a bottle of tequila (why yes, it was a fabulous party) and in the few seconds before the spill was cleaned up, we noticed the fruit flies swarming to the boozy puddle. Inside the trap? It was fruit fly central. Bottom line: Works surprisingly well. - Rotten fruit. I know, it's disgusting to even read that. But many have praised the power of well, giving the fruit flies what they want. I placed a few slices of overripe peaches into the trap and waited. The next day, there were a considerable amount of fruit flies in the trap, but not as many as in the apple cider vinegar, wine and tequila traps. I was also concerned that this wasn't so much a trap as a breeding ground. Bottom line: It works, but not effectively. If you want to get rid of fruit flies now, you can do better than standing around smacking the air. Here are a few...creative...approaches to the job. - Hair dryer. This is a bit gruesome. What you do is turn on your hair dryer so the nozzle faces away from the fruit flies. (So the flat end faces them.) The fruit flies get sucked into the dryer and then will roast to death from the heating mechanism. Does it work? Sort of. The effort to chase the fruit flies with a dryer outweighs the number of flies you actually get. Also, most hair dryers have several guards over the flat end anyway, reducing your overall fruit-fly-catching ability anyway. Also, you'll have dead fruit flies in your hair dryer. Bottom line: Bad idea and not worth the trouble. - Incense. You either like the scent of incense, or you don't. I'm in the latter camp, with the rare exception of cedar-scented incense during the wintry months. But in the summer? No thanks. But, it's a recommended tip, so I'll try it anyway. The idea is to essentially smoke the flies out of the room. Their tiny fruit fly lungs can't handle the smoke, so they die. While I absolutely hated the scent, this actually worked pretty well. The counter looked like the Fruit Fly Civil War occurred, though, involving much disinfecting afterwards. Bottom line: Effective, but a nuisance if you dislike the smell of incense.